Gluten-Free … should YOU be? How I got into this…. In my gluten-free life (see Sonic Boom Wellness hyperlink for what I do for a “real” career), I’m considered an expert on the gluten-free diet as well as the medical conditions that benefit. I’m proud to be a partner with General Mills and their awesome site, www.glutenfreely.com — General Mills is committed to the gluten-free community, and I’m helping them with their strategic initiatives. I’ve also consulted with Prometheus Laboratories, Hain-Celestial, and several other manufacturers. I’m always honored to be able to provide my guidance. I’ve written 6 bestselling books on the subject of the gluten-free lifestyle and medical conditions that benefit. Take a look at them on the books section of this site. I founded R.O.C.K. in 1991 as a way to have kids celebrate their gluten-free-ness. We have R.O.C.K. parties (all about the food!) – they never have to ask, “Can I eat this?! ?” At first, it was just my family having our little R.O.C.K. parties – but word spread, and today we have 150 chapters throughout the U.S., Canada, and Hungary! We welcome kids who are gluten-free for any reason, and we make the events fun, informative, and very much a celebration of the awesomeness of being a gluten-free kid. To find a R.O.C.K. 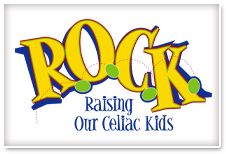 chapter, go to www.celiackids.com or www.gfcfdiet.com – and to start a R.O.C.K.chapter in your area, please contact me. I do LOTS of media interviews! 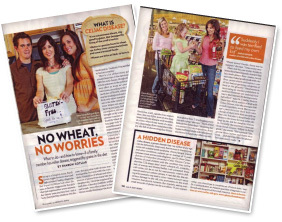 I was featured in People Magazine in June 2007, where they deemed me the “Gluten-Free Guru” and called me a “Mom on a mission to save millions.” Lindsay Lohan made the cover (not her best days), but I was happy with our two pages, even if the pictures of my kids and me aren’t my faves. I still do at least a few interviews a month – TV, radio, newspaper, magazines, and journals. I love it, mostly because it gives me a chance to espouse the many virtues of the gluten-free lifestyle. Got an interview opportunity? BRING IT!